Kompakt og handy sæt med stort lysudbytte. 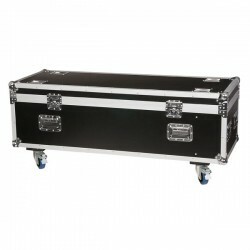 The perfect solution for all musicians, mobile DJ's and small rental companies. The Compact Power Lightset brings you a complete lightset including all accessories in only one package. It comes complete with 4 high power and compact LED spots. Each spot contains 7 3-in-1 RGB LEDs in order to create a high light-output. The spots are mounted on the T-Bar which has a built-in controller and power-pack. The T-Bar can be controlled either by the included footswitch or by DMX. Delivery is including carrying bag, stand and footswitch. So ready to use. Jack stereo forlænger - 10 mtr.